I love knitting this Clapotis. Dropping stitches is almost as satisfying as popping bubblewrap. I have 9 of 13 repeats done on the length, though will definitely add some extra repeats to get to the length that I want. If I knitted this again in the same yarn I would certainly use a smaller needle, maybe 3.25mm. As it is, the open nature of the fabric looks just fine – though reminiscent, in this colour, of chain mail. I’d just like to see it sleeker. It would be good to knit this one day as written and make a large one in the suggested yarn. Unfortunately 4 skeins of the suggested yarn comes to Â£64.00 For a scarf!!!! And dry clean, to boot. But, just look at that Aslan colourway, wouldn’t a Clapotis look fine in that? Or, even better, in the Irving Park colour. I need to find an aran weight alternative in 50% silk/50% wool. Colourmart don’t seem to do one but they do a 55% Cashmere/45% silk (currently out of stock) that I may have to keep a weather eye on. Have I developed a Clapotis addiction? Perhaps I have. I do love the one that I already have and wear it frequently, even in the house. And, let’s face it, they are a very good quick-fix knit. Kind of the knitting equivalent of comfort food and mindless TV, with a glass of cheap plonk on the side. 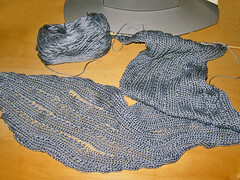 I wonder if there is a support group for Clapotis addicts? NTS: I really must tidy my desk to the extent that I can push my monitor out of the way when I want to take snapshot of my knitting.